As bush pilots, we must accept the unpleasant fact that psychological considerations have an important bearing on safety. It is well known that most aviation accidents are caused by errors of judgment, and most of these errors are rooted in the pilot's attitude. To improve our safety record, we must improve our attitude. Impatience with weather, get-home-itis, machismo, a lack of care or forethought -- these are our deadly enemies, the foes we must defeat. To help you understand the elements that go into a healthy attitude, I'd like to place this discussion in its natural context and take a look at some of the situations (and choices) the bush pilot encounters in his daily work. To do this, I'm going to shift gears slightly and utilize writing techniques (imagery, dialogue, foreshadowing) that are more common to fiction than nonfiction. In this way, I hope to pose problems the bush pilot faces more vividly and, by so doing, help you to understand the mindset demanded for maximum safety. 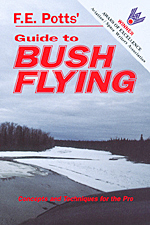 This section provided me the most pleasure in writing, for it is here that I was able to escape from the dry textbook mode into the reality of what flying and living in the North is really like, what it means to be a bush pilot, and why remote-area operations (and the associated life-style) are such an incredible joy.